This is the second of a two part post about the use of Malleable VIs in a practical project – rewriting a test system to use TestStand. In Part One, I introduced the project and the decision to use LabVIEW OO and Hardware Abstraction Layers to allow an easy switch between Simulated and Physical hardware in the test sequence. In this part, I will discuss the implementation in more detail and how I am using the Class Adaptation feature of Malleable VIs. 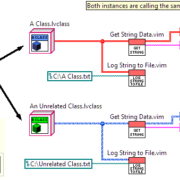 Class Adaptation allows me to create a malleable VI that can act on unrelated classes (i.e. no inheritance between them). I believe in Computer Science terms, this qualifies as some sort of Mixin.